With almost 200,000 miles on the original engine and transmission, this 1993 Acura Integra GS-R certainly surprised us! We had so much fun and we will be returning to the $2018 Challenge. A surprising number of people told us how migraines have affected them and/or their loved ones. 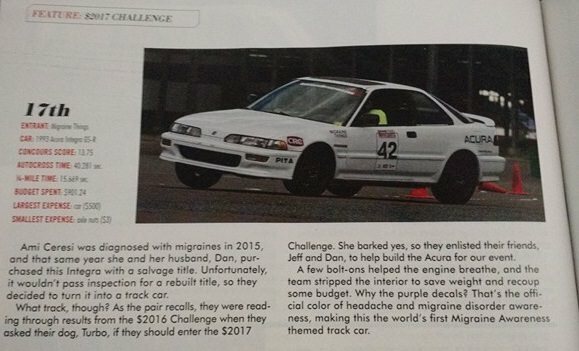 Those conversations cemented the fact that there is a place for a migraine awareness themed track car. The team is already busy planning modifications for next year’s event. We are definitely going back for the $2018 Challenge but we'll be changing a LOT of things and running in the full-budget class. Our team is now 5 people strong and I have hunted down almost all of the parts -- including parts from @b17bdb2 , @dpaton and @mutt8588 -- that we need. If you've been wanting to enter a $20xx Challenge, it's great fun and we highly recommend it! knavekid and dpaton like this. I'm hoping I can continue to help you with that thing for that thing on the thing on the car for 2018, and that it might lead to better numbers this year! Following the facebook page. There is another image of the integra on pg 48-49 drag racing with that subaru powered honda insight.